The most expensive presidential race in American history—some $2.6 billion was spent—is finally coming to an end. The barrage of political ads is quieting, and voters now have the chance to speak. Polls close in Virginia, Indiana, Georgia, Kentucky, South Carolina and Vermont at 7 PM ET, with other states following close behind. 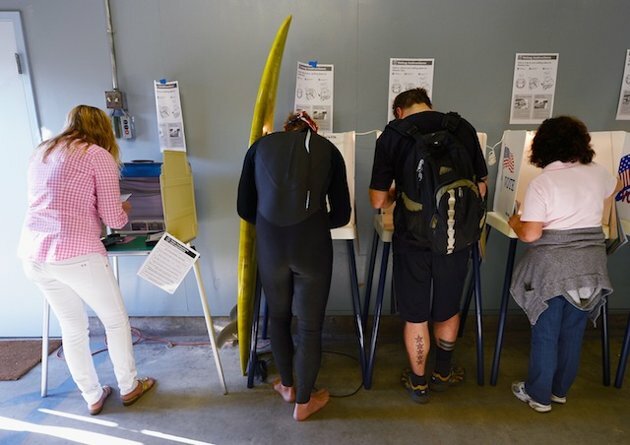 Alaska’s polling stations, the last to close, finally shutter at 1 AM Wednesday. In the meantime, we’ll be gathering all the latest news about the candidates, polling stations and swing states here. 2:50 PM: Check out this series of photos of voters in Queens, who took a break from trying to salvage their Sandy-hit homes to vote in makeshift voting stations today. 2:40 PM: Guess they’re not too nervous for a big lunch. Paul Ryan and Mitt Romney grabbed lunch at a Wendy’s in a Cleveland suburb after stopping by a campaign office. Here’s a photo of them greeting the staff. Joe Biden, meanwhile, grabbed lunch at a local restaurant in Sterling, Virginia, where he had a Cobb salad. 2:38 PM: For the third day in a row, Joe Biden and Mitt Romney’s planes passed each other on the tarmac. This time, in Cleveland. 2:30 PM: A judge has ordered officials to cover up the Obama mural in a Philadelphia polling place that raised controversy earlier today. 1:45 PM: NBC has confirmed that an electronic voting machine in Pennsylvania changed a vote from Obama to Romney earlier today. The machine has been taken out of service. 1:20 PM: An estimated 50 million eligible Americans will not vote today. Here’s why. Posted in Breaking News, HYPE-ALERT, NEWSTagged America heads to the polls, Election Day, Election Day: America heads to the polls, News, politicsBookmark the permalink.